1754-1816. He was the son of Lieutenant William Osborn, who had served with Captain Hon. Samuel Barrington aboard the Achilles 60 during the Seven Years War, and was the brother of Vice-Admiral John Osborn and of Vice-Admiral Edward Oliver Osborn. Samuel Osborn was promoted commander on 29 April 1779, and after a period aboard the receiving ship Dragon 74 at Portsmouth from October 1780, and having temporarily commanded the Berwick 74 in the Channel from May 1782 for Captain Hon. Charles Phipps, he was posted captain on 6 July. After recommissioning the Romney 50 at the beginning of 1783 he paid her off in April. Osborn commanded the Ariadne 20 on the Nova Scotia station from 1784 until he paid her off towards the end of 1787. Osborn spent many years in command of the Centurion, here depicted in a later action in the East Indies. 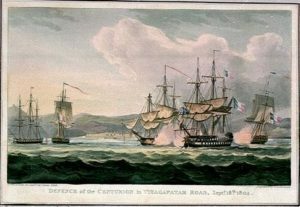 In December 1792 he recommissioned the Centurion 50, going out to the Leeward Islands at the commencement of the French Revolutionary War in February 1793, and then sailing for the East Indies during November. On 22 October 1794, being in company with the Diomede 44, Captain Matthew Smith, he fell in with the French frigates Prudente 44 and Cybèle 40, the corvette Jean Bart 20 and the sloop Courrier 20 off Mauritius. The Diomede provided such little support that her captain was later dismissed the service, and although the Cybèle 40 was roughly handled she made good her escape. The Centurion lost three men killed and twenty-four wounded in the engagement and also received much damage. 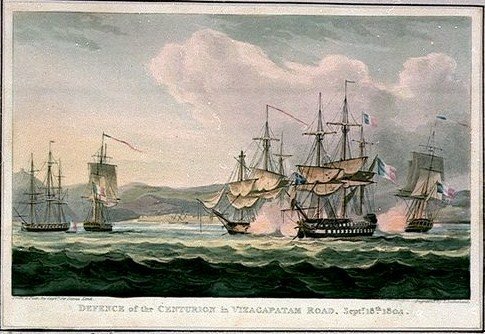 In 1795 the Centurion served in the expedition that took Trincomale on 26 August, and in 1796 Osborn had the same vessel in the lucrative expedition to Amboyna and Banda, earning £15,000 prize money. After leaving her in 1797 he briefly commanded the Dutch prize Vindictive 28 at the Cape in the spring of 1798. Whilst he was serving at the Cape and in the East Indies his two brothers were also employed on those stations. From the late summer of 1801 Osborn commanded the Ramillies 74 in the Channel and later off Cadiz before coming home to Portsmouth in early December with the flag of Vice-Admiral Sir Charles Morice Pole. The Ramillies was then employed in home waters until the peace in the spring of 1802. He briefly commanded the Windsor Castle 98 during April 1804 but left her when promoted rear-admiral on 23 April. He was further promoted vice-admiral on 28 April 1808, and admiral on 4 June 1814. Osborn died on 10 September 1816. He left his property at Mill Hill, Isle of Wight, including a windmill, to his two brothers. His widow died in 1842.